Recently I was asked if I would like to try out the Footner Exfoliating socks for Dry cracked feet. Initially i thought, oh god this means getting my feet out for a review, but after some thought I decided i needed to do it to see if this product is worth it. 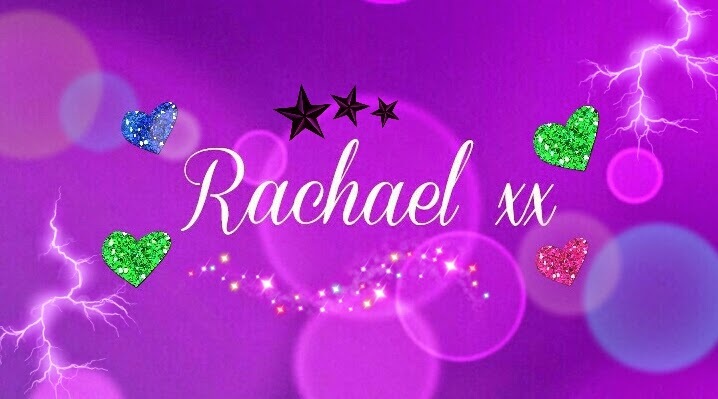 So i decided to unleash my feet and give it a go! I love using products with glycolic acid in them as the acid is great for renewing cells in the skin, so I knew from the start I would like these. 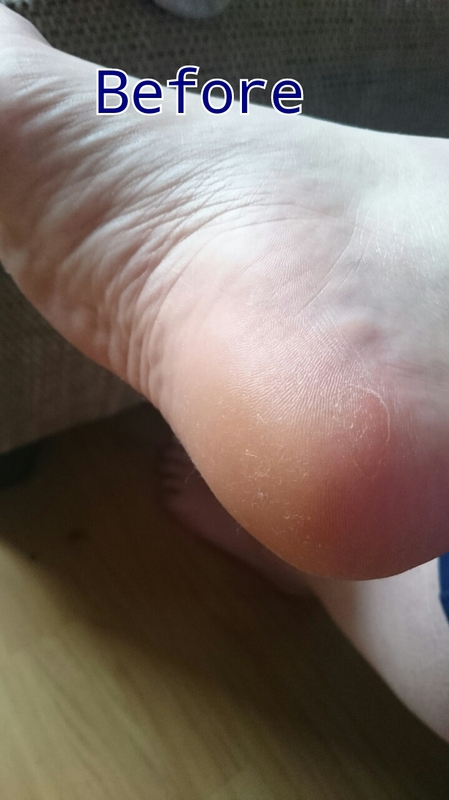 Those of you with a foot phobia be aware as there are photos! Footner Exfoliating Socks is a revolutionary product to give you smooth, softer feet with just one 60 minute application Footner Exfoliating Socks make use of the skin’s natural exfoliation process to rid your feet from years of dead skin build-up. After just one application your feet will shed this dead skin. Feeling young and rejuvenated, your feet will be smoother than ever. Using this product will result in the peeling of the hardened skin build-up on your feet. Footner Exfoliating Socks makes use of the skin’s natural peeling process to remove callus and dead skin from the feet. 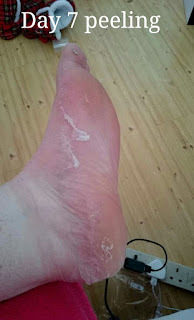 5-10 days after application the layers of dead skin will peel from the soles of the feet. This peeling process will continue for about 2 weeks depending on the thickness of the skin. So before I go on to how to use these I am going to share my before photos. They don't look too bad but they were really hard, dry and cracked. When you open the box you are greeted with 2 socks folded over and a set of instructions. You begin by cutting the socks along the dotted lines. Once the socks are cut, open them up and place feet in. Tie the socks using the tape provided. I didnt feel it was secure enough so i wore a pair of normal socks over these to keep them on. Leave the socks on for 60 mins, it's a good excuse to sit down to your favourite tv programme. Once you have completed the 60 minutes, take off the socks and was feet thoroughly in the shower. Dry well. 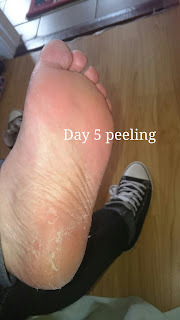 Allow 5-10 days for your feet to start peeling. My feet began to peel after Day 3. It is very hard to avoid picking at the peel but for best results please do not assist the peeling in any way. 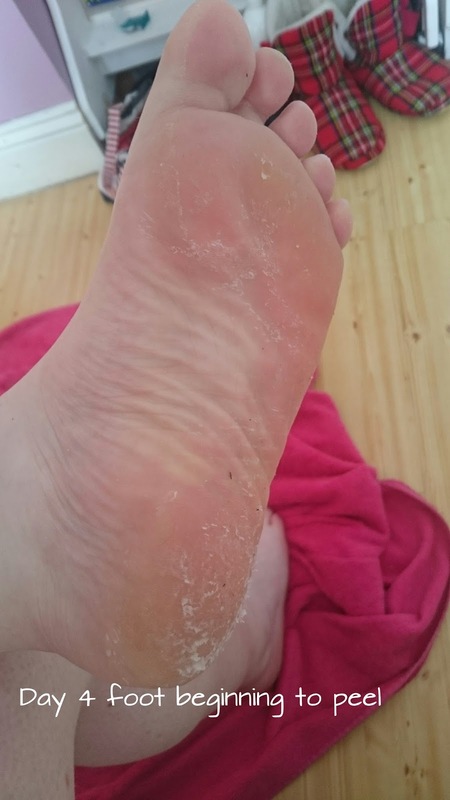 It states on the instructions that if you're feet have not began to peel after 5 days you can soak feet in hot water to speed up the process. 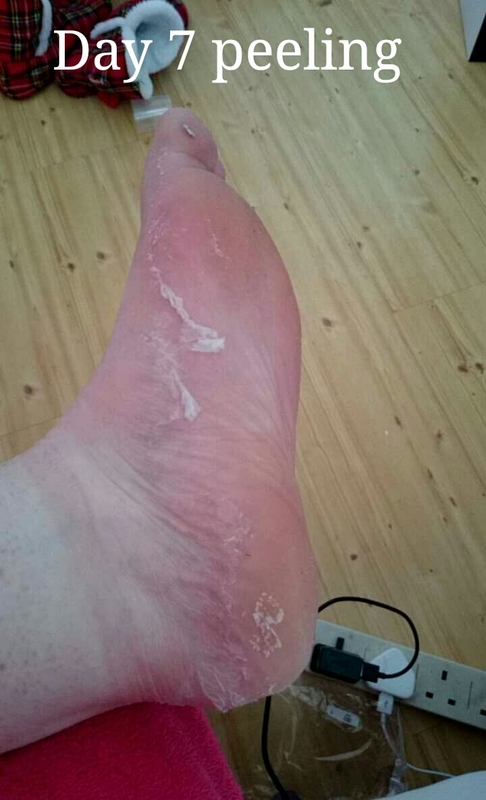 After 10 days my feet had peeled fully and no signs of hard dry cracked skin were visible. My feet were baby soft. 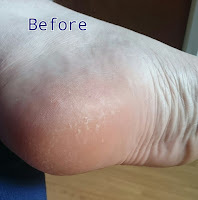 I have to say I was completely in love with the results, I loved how simple it was to use, there was pain at all, and my feet are still completely smooth and soft nearly 3 weeks later. I have previously used the Exfoliating Foot Socks from Sam McCauleys and Pennys and the results last barely 2-3 weeks and the pricetag is just under 5 Euro. 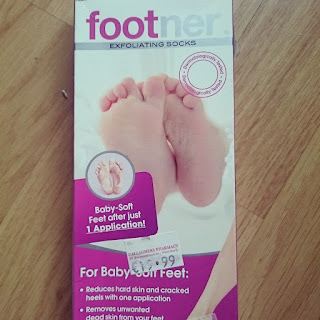 These Footner socks are 19.99 in Gallaghers locally and I have been told from a reliable source that they themselves got a whole summer of smooth feet by using these socks once last April. Now that in itself justifies the 19.99 pricetag. I would prefer to pay 20 euro for one pair of socks than to be buying 3-4 pairs of the other ones as the results do not last as long at all. Below are my results where you can see for yourselves how smooth and soft they are. Aren't the results great? I'm really really chuffed with them. Has anyone else used these? How did you get on? 10 things you DIDN'T know about me! Irish peat the answer to all HOLY YOUTHFULLNESS!